Thin records and vacuums in 1913 "1,062,579. 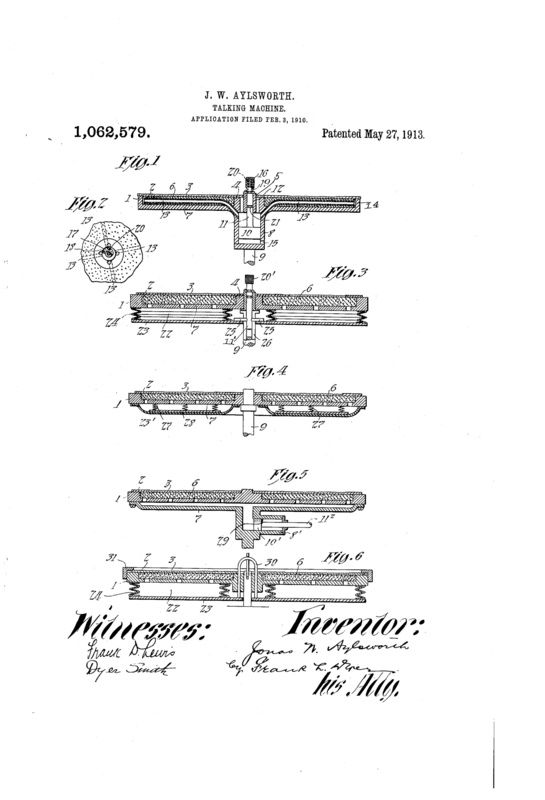 Patented May 27, 1913"
Was it a high end turtable makers of the 80′ that told us about new things? This patented invention relates to talking machines or phonographs, and my object is to produce a talking .machineof the type Whicr operates upon disks or flat sound records, which will permit the use of exceedingly thin records and record blanks, which, because of their thinness` are flexible, light, and inexpensive in comparison with the common type of comparatively ,thick disk records `known to the art.l Exceedingly thin -records of the character specified are more particularly described and lclaimedin application Serial No. 541,764, filed by me on even date herewith. Reproduction can be made from such records`on disk talking machines as known to the art with but most imperfect results, if at all, because such records have not suiicient backing in themselves for-the stylus to react against, and because also, when supported upon the usual turntable or record support, they will not lie sutliciently flat and even upon the support to permit the stylus to properly track the same and be fed thereby. More specifically, I provide a record support of porous material and exhaust the air from the pores of this material and beneath the under surface of the record to hold the same upon the table by suction. Attention is hereby -directed to thel accompanying drawings, forming part of’ this specification and illustrating a number 0f watys in which my invention may be carried ou vertical cross section t rough a t-able and disk sound record supported thereby, together with means for creating suction to hold the rcord upon the surface of the table and embodying one form of my invention. F ig. 2 represents a partial plan view of the same. Fig. 3 represents a view similar to Fig. 1 of a modified’ form of my invention. Figs. 4, 5 and 6 represent similar views of other modifications. Next ›A good friend in Japan is doubling up on the vintage !